The Spotswood Pumping Station completed in 1896 and built as the key component of Melbourne's first centralised sewerage system, was initiated by the Melbourne and Metropolitan Board of Works in 1892. Designed in the French classical revival style by engineer Christian Kussmaul, and constructed by contractor AG Shaw, the complex consists of a symmetrical arrangement of two pumping houses, with their associated boiler and coal bunker buildings, and two polygonal straining well houses which are constructed of red brick with contrasting cream detailing around three courtyards. The entrance to the central yard is flanked by imposing mansard towers. Important accretions include the two-storeyed, brick managing engineer's residence built in 1898, three WWII air raid shelters, two substations and a valve house. A unique collection of steam engineering equipment as well as tools, furniture and other objects, remain at the complex. Spotswood ceased operation in 1965, although sewage still flows under the site. 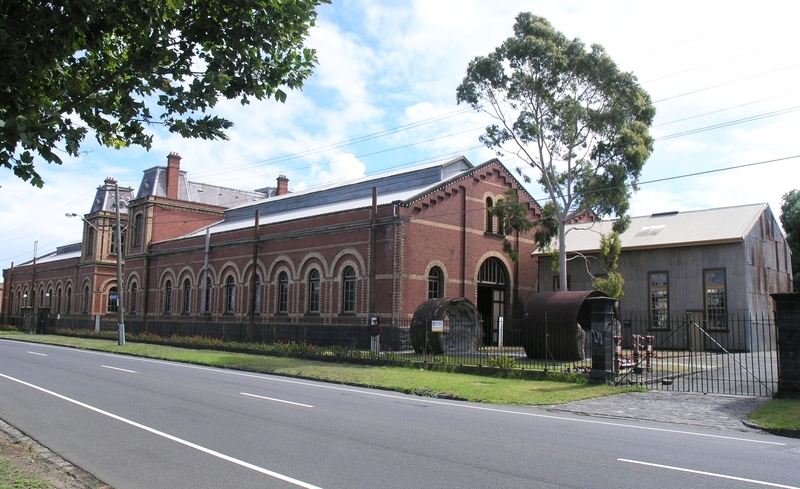 The former Spotswood Pumping Station now managed by Scienceworks, is of historical, technical, architectural and social importance to the State of Victoria. The Spotswood Pumping Station is historically important as the key component of Melbourne's first centralised sewerage system which began operations in 1897 when the first connections between toilet and sewer pipe were made. The station is unique in Australia as an intact ensemble of buildings, sewage pumping machinery, and objects. In terms of its integrity and rarity the complex has no parallel in Australia. The Spotswood Pumping Station is technically important as an ambitious exercise in engineering that supplied the force to move millions of gallons of the city's sewage each day. Its 1901 English, Hathorn Davey steam engine, one of the most advanced pumping engines in the world at that time, is possibly the oldest extant engine of its type in Australia or Britain. With the 4 locally-made Austral Otis engines, the pumping installations at Spotswood form one of the largest collections of engines and devices functionally related to an industrial site in Australia and Britain. The station has further technical importance for its ability to demonstrate the processes of sewage treatment in the nineteenth and early twentieth century, and the machinery and associated tools chart the technological life of the complex from steam power to electricity. 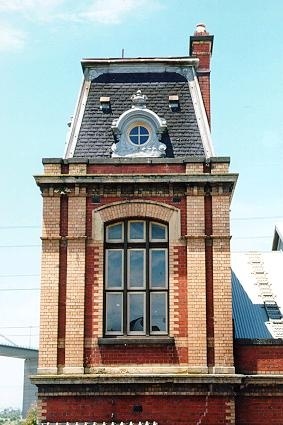 The Spotswood Pumping Station is architecturally important as an extraordinary example of the Late French Empire style employed in an industrial complex, its decorative and formal qualities being illustrative of the grand tradition of nineteenth century industrial buildings built to celebrate the rise of technology. Spotswood Pumping Station has significant social associations with the benefits its sewerage system brought to Melburnians; namely basic sanitation, and a dramatic improvement to its citizen's public health. The former managing engineer's residence, and the bacteriologist's laboratory (occupied by the only women ever employed on site), are both socially important for their associations with key staff and their specific roles. Sewerage Pumping Station, Douglas Parade, Craig Street and Brooker Street, Spotswood, City of Hobsons Bay. 1. All of the buildings, including all fixed machinery associated with these buildings, above and below ground (as identified by Scienceworks and listed in Appendix 1) being the south strainer house B1; south coal bunker, boiler house, pumping house and tower B2; north coal bunker, boiler house, pumping house and tower B3; north strainer house B4; north incinerator B5; corrugated iron workshop B6; 25 cycle substation B7; 50 cycle substation B8; valve house B9; managing engineer's house B10; the air raid shelters A1-A3; the external stairs marked S1 and S2; the embankment wall E1; the Douglas Parade iron fence, pillars and gates F1; the north brick boundary wall F2; the external driveways marked D1-D3; the north and south chimney foundation and flue tunnel remnants marked C1 and C2; the movable objects; namely the unfixed boilers in the north boiler house marked 01 and 02, (as well as all tools, associated mechanical objects, and furniture identified by Scienceworks); indicated on Diagram 602522 held by the Executive Director. 2. All of the land marked L1 including but not limited to the following historical features in or on that land; the northern, central and southern courtyards around the pumping station complex, including the 'covering way' in the central courtyard, the sewer inlet and outflow mains, maintenance tunnels and steam lines, the pavements and brick gutters around the pump house buildings, as described on Diagram 602522 held by the Executive Director being the land described as Crown Land, Parcel 542 in Index Plan No. 1003. The pumping station has a prominent position in Douglas Parade, on the west bank of the Yarra River at Spotswood, in the City of Hobson's Bay. The complex consists of a symmetrical arrangement of twin pump engine houses with mansard roofed towers framing the entrance to a central courtyard. At the rear of these buildings are twin boiler houses. Polygonal strainer houses with lantern roofs stand at either end of the main buildings giving balance to the whole, behind a wrought- iron palisade fence. The structures comprising Spotswood Pumping Station include the North and South Engine Houses (with attached rear boiler houses), the North and South Straining Wells, the 50 cycle substation and 25 cycle substation, corrugated iron sheds, valve house, timber sheds, incinerator with chimney, three air raid shelters, wrought-iron front fence, bluestone drive-ways, brick guttering, stairs, embankment wall, the 'covered way' and courtyards. The architectural modelling of the external surfaces is complementary to that of the French classical pumping houses. Constructed on a concrete base, the walls are brick and the openings are arched and detailed in cream brick and stone. The projecting cornices are of Waurn Ponds limestone, the parapet capping is of basalt. The round-headed windows are multi-paned, and the large doors are multi-panelled. The roof is supported by elaborately trussed timber framing and is surmounted by a louvered lantern. Internally the wells have been capped with concrete and the strainer cages removed, however the original steam powered winch remains. The courtyard forms the spatial link between the associated functions of the south strainer house and the south pumping house. It marks the progress of the southern trunk. A steam line providing motive power to the winches in the strainer house crosses the courtyard through a trench covered by cast iron plates imprinted with a geometric design. The yard is sealed with asphalt. A reinforced concrete air raid shelter built in 1942 stands in the south west corner of the courtyard. It is partially underground. Its original timber door has been replaced with a wire door. Toilets in a lean-to structure by the entrance to the boiler house/workshop appear to be in their original position, although the external fabric is not original. This building has been adapted to an engineering workshop and store and in the process has lost all internal evidence of its original function. The building is constructed with red brick with cream coloured detailing. Now used as a workshop, the interior has lost all evidence of its original function. Roof framing is original although the roof lantern is no longer glazed. The building is constructed with red brick with cream coloured detailing. This pump house has perhaps the earliest major Hathorn Davey steam pumping engine in Australia. It is retained in its original operational position. These engines were regarded as the best available in their time. The MMBW chief engineer, Thwaites, had hoped to obtain all Hathorn Davey machines for the original installation, but only one was acquired. As there was no patents on English engineering machinery in Australia at that time, it was intended to use the Hathorn Davey as a model for the production of locally made examples. The Austral Otis engines installed in the North Pumping House were essentially copies of the Hathorn Davey. Additionally, the South Pumping House retains a mixed collection of equipment added throughout the operational period, and tools unique to the servicing of these devices once hung on the walls to the rear of the machinery. Many of these items now belong to the museum's catalogued collection. The external architecture is styled in a similar fashion to the South Strainer Well, the only difference being the shape of the building which is rectangular with a long (now covered) lantern extending along the roof. The windows are similarly arched and paned and the brickwork is red with contrasting cream detailing. Some of the cream brick is substituted by glazed terracotta inserts as hood moulding over the arched windows of the pumping station. Colour matched Waurn Ponds limestone is used for the projecting cornices. The tower was used for offices at ground level, changing rooms at first floor level, and on the second floor the rooms were fitted out as a laboratory (and also included a womens' toilet) in the 1940s for the use by bacteriologist, Lucy Alford. A number of original marble fireplaces remain in the ground floor rooms, and the original painted joinery of the towers is intact. The ground floor east-facing office retains some of its original furnishings. The bunker and its associated boiler house have a high level of integrity. The design of the boiler house allowed for a maximum of six boilers and opposite each boiler there was a corresponding bunker door or gate. The bunker retains its original cast and wrought iron doors, the structure and grading of its floor, and its original roof structure including the lantern. This has a high level of integrity and is significant for its ability to aid interpretation of the operational site. The south side of the complex was more quickly converted to electric pumping leaving the north side of the pumping complex relatively untouched with more operational steam pumping equipment left in situ. In 1897 three boilers had been installed in each of the boiler houses, although the design of each house allowed for six to occupy the space opposite each coal bunker The installation of the Austral Otis engines between 1901 and 1913 necessitated an increase to five boilers in each house. The two Thompson boilers occupying the boiler room today have been moved to this position for interpretive purposes, although they formerly stood in roughly the same spot. After its decommission one had spent some time in the courtyard (from about 1960) before being moved back inside by the museum. These boilers were described as marine boilers because they were freestanding or flat floor structures plugged into a tall brick flue. The roofing framing and ceiling lining is original. The ridge lantern is no longer glazed and is now clad with corrugated iron and plastic. The roof was changed from slate to iron in about the 1950s and the iron was replaced again in the 1980s. The asphalted courtyard marks the coming together of the pumped flows from the north and south pumping houses, as well as the point of discharge along the rising main. The circulation between both north and south complexes occurs across the courtyard, as does access to the upper level of the embankment via a stair which is reinforced by a red brick arch attached to the red brick embankment wall. To the north of the arch, just off courtyard centre, the 1942 below ground air raid shelter pierces the wall. The formal opening is graced with a lintel of contrasting detail. The symmetrical arrangement of the pumping station complex is centred on the courtyard. The central courtyard has an iron floor below the asphalt known as the "covering way". The original collector tanks and discharge piping are situated under the iron floor. The space of the "covering way" sits at a height of approximately 60 feet above the incoming sewer trunks, between the massed concrete forms of the deep north and south pumping wells. It is significant that Spotswood retains the whole of its original operational discharge hardware. Today barriers direct predestrian traffic through the courtyard as the "covering way" may be subject to collapse. The floor and its framing have suffered extensive corrosion from moisture penetration, as has the sub-floor timber catwalk used for the inspection of the pipes and tanks. This building is architecturally the same as the South Pumping House. The pump house is significant due to the intactness of both the structure and its collection of equipment. Ridge glazing has not been retained. The Austral Otis stream pumping engines in the north and south wells are the originals. The electric pumps in the central wells replaced the original Thompson engines in 1938. The rooms at all levels were simply finished. At ground level there were offices, and at first and second levels there were change rooms which are known to have also operated dormitories for the afternoon shift. Marble fireplaces remain on the ground and first levels, and joinery remains intact. The exterior displays a slate mansard roof with zinc framed oeuil de boeuf windows. The same as the South Strainer Well building. Both were originally constructed on an octagonal plan to form a single well, but were enlarged about 1928 to allow two screening positions to operate. Some of the equipment used in the straining operation remains in the building. This structure is intact with red brick chimney and small furnace. It stands on the north west side of the North Strainer Well building. It is where refuse from the straining well was burned. It is important in the interpretation of the pumping station operations. The partially prefabricated workshop of about 1913 is located in the north yard between the north pump house and the north strainer house. Although about one third of its length has been removed from the north end, the shed retains a high degree of integrity. The interior contains lathes and other machinery. The surface is asphalted. The yard includes, a north stair giving access to the upper level embankment, a small open air display of pumping equipment including a section of original sewer, a recently completed odour treatment plant, a small, brick substation, and a freestanding reinforced concrete air raid shelter of 1942, complete with its original wooden door. Located on the south side of the complex (near the South Strainer Well) to receive electrical power from the nearby Williamstown power station. Significantly intact, it retains some operational function and is partly used for storage. It provides a good understanding of the development of the power station this century. Although the style observes the red brick and arched windows of its fellow buildings, the square roof line is a departure. This building demonstates the sequence of adaption of the pumping station to technological change. The rather simple red brick, gabled building is located at the top of the embankment to the southwest of the southern pumping building. It received power from the Newport power station. It is intact and remains operational. The internal and external fabric of the valve house demonstrates the path of the rising main. Evidence of the route of the rising mains through the vale house can be seen in the brick filled circular holes remaining after removal of the piping; there are four incoming pipes on the south wall, one on the east wall and three outgoing on the north wall. The earlier presence of the valves is less easily read. The base of the building and its roof are of reinforced concrete, while the walls are of red brick with multi-paned, metal-framed windows. The building is currently used for storage. This building is significant for demonstrating the administrative and supervisory hierarchies maintained during the operational period The necesssity of having the manager on site demonstrates the essential nature of the pumping station operations as well as the communication and transport constraints of the day. The interior has been altered and is therefore not particularly significant. The exterior has been altered by the removal of the first floor verandah (which had decorative cast iron panels) and loss of a designated garden curtilage. The spatial relationship between the house and the pumping works has been interrupted by the 1990s museum building. Constructed of dichrome brick, the house matches the fabric of the pumping station. Two sides of the house have been subsequently rendered. The wrought-iron palisade fence and gates, and the square, stone, capped pillars complement the French Second Empire character of the main buildings and reinforce the formality of this section of streetscape. The bluestone cobblestone driveways located at each of the three entrances survive although the blocks have recently been relaid inappropriately. An intact red brick gutter or channel runs the length of the iron fence in the front garden. It is similar to another red brick gutter within the complex. The Spotswood Pumping Station used to operate with two chimneys which once stood above the embankment on what is now the grassed area. The location of the chimneys is indicated in the plans accompanying the report prepared by O'Neill and Taylor (1995). The chimneys were integral to the functioning of the pumping station from its steam age beginnings. The South Chimney, the first to the constructed, was erected between February and August 1896 by James Mullin at a cost of ú1205. It was reputedly 165 feet high from the ground, 178 and a half feet from the grate surface in the boilers, and 194 and a half feet above low water mark. The stack was circular in section with an internal diameter of 11 feet 3 inches at the bottom and 8 feet at the top. Although the chimney has been demolished its square cement base survives in fair condition underground. Excavation has determined that 4-5 meters of constrcution is still intact underneath including the double flue to the boiler room whivh is three bricks thick. The North Chimney was built some time between 1900 and 1925. Its flues from the North Boiler House were constructed under the northern buildings by 1900. Prior to construction of this chimney, a cross flue between the northern and southern boiler rooms enabled the South Chimney to provide for the northern rooms. The North Chimney was of a similar height to its earlier companion but had a slightly smaller internal diameter. It is not known when both chimneys were demolished. The North Chimney base is said to survive in better condition, although it is not know if formal excavation work has been undertaken. The station has a significant complement of large sewerage pumps installed at intervals over its working life. Much of the machinery and other internal fittings remain, and are intact to a degree which is unique for this substantial station. The machinery and discharge pipes were generally wrough iron. At its peak the station had ten triple expansion condensing steam engines driving vertical direct plunger pumps. Five steam engines now survive at Spotswood. The oldest steam engine and pump at the station was manufactured by Hathorn Davey and Company (England) in 1900 and delivered in 1901. It is located in Well No. 5 in the South Engine Room. It is an inverted triple expansion Corliss surface condensing rotative 3 crank engine. They ceased duty in 1947. The four Thompsons triple expansion single direct acting Worthington type pumping engines of 1898 no longer exist. The steam engines were fed with steam at 150 pounds per square inch from ten manually stoked boilers, made from Thompsons of Castlemaine. Two of the boilers survive and have been placed in the former boiler house of the North Engine Room. This room is now used for display and reception purposes. Extracted from a 1990 paper by Patrick Miller on the building of the sewer sytem. (The information collated here is found in Board Minutes (BM), Contracts (Contr), Annual Reports (AR), Progress Reports (PR), Memos (Mem) of the Chairman (Chmn), Engineer-in-Chief (EinC), Secretary (Sec), Superintending Engineer of Sewerage (SES) and Superintending Surveyor (SS). Spotswood (formerly Spottiswoode) is on the west bank of the Yarra at the junction with Stony Creek and not far from the junction with the Maribyrnong. It is at the focus of the entire natural drainage system of the Melbourne metropolitan area. The pumping station was designed to eventually house 20 coal fired steam pumping engines in two symmetrically opposed buildings. At first it was thought that coal would be delivered by water to a jetty on the river, but a railway siding was built instead (BM 1 Sep 96). The Board selected the land that they required in October 1892 (BM 18/10/92). Their offer of ú4,625 for nine and a quarter acres was rejected by the Spottiswoode Estate Company and went to arbitration (BM 2/10/92, 30/5/93, 22/8/93, 3/10/93). In the meantime, the Board was allowed to start work on the excavation for buildings (AR EinC 1894). The successful tenderer for the excavation for engine and straining wells and their connecting tunnels, and the construction of the overflow sewer was Garnsworthy and Smith for ú34,322/17/8 (BM 20 Feb 94, contr 181). Starting in March 1894 the contractors pushed this work on in continuous shifts by the light of electric arc lamps (PR 11 Apr 94). By June they had removed 17,712 cubic yards of mainly basalt rock (PR 18 Jun 94 photos of this are in early Board publications). By the following June they had completed this contract with the removal of 33,400 cubic yards of rock and the laying of 9,400 cubic yards of concrete (PR 3 Jun 95). In February 1893 the exact site for the pumping engines was fixed (BM 21 Feb 93). The following month the Austral Otis Elevator and Engineering Company Limited asked the Board to inspect the vertical triplex expansion condensing pumping engines it had designed and constructed for the Rockhampton City Council (BM 11 Apr 93). Nonetheless, the contract for the first four steam engines and pumps was let to Thompson and Company of Castlemaine for ú38,925/19/7 (contr 150). The engines and boilers were manufactured in Castlemaine, erected there and then dismantled for shipping to and re-erection at Spotswood. By November 1895 all the work at Castlemaine had been finished and the engines and boilers sent to Spotswood (PR 19 Nov 95). The erection and testing of the boilers and engines took place over the following 18 months and finally on 8 February 1897 steam was got up in No 1 Engine. There was trouble with the Thompson engines several defective cylinders had to be replaced (PR 26 Jul 97). A new high pressure piston rod was fitted to no 3 engine (PR 23 Aug 97)The tone of the Engineer-in-ChiefÆs remarks about the engines and boilers and their constant niggling faults during 1897-8 tends to indicate that he was not very happy with their performance. This is re-inforced by the tone of hisreport regarding the closing of the contract (BM 31 Aug 99). After giving a Colonial firm every opportunity of constructing suitable and reliable pumping engines, and in consideration of the emergent necessity of supplementing the engine power in the Southern Engine Room through the danger of one of the engines made by them breaking down and thus throwing the whole system out of gear, I am of the opinion that it is absolutely necessary to obtain a pattern engine from a leading English manufacturing firm of pumping engines at the earliest possible date. The Board accepted his advice (BM 24 Oct 99). James Mansergh crops up again here suggesting to the Board that 18 months would be a better time than 12 for completion of a contract for a pumping engine (BM 13 Mar 00). Perhaps he and Thwaites had been consulting over the matter? In April 1900 a letter was received from W. and A. McArthur Ltd with reference to the tender of their principals, Messrs Hathorn, Davey and Co for supply of one sewage pumping engine, and stating that if the Board ordered two engines they would be supplied for ú22,450. At the same meeting a cable from Mansergh and the advice of Thwaites recommended the purchase of a pumping engine to be used as a pattern for others from Hathorn, Davey and Co, Leeds for ú11,475 (BM 10 Apr 00). At a subsequent meeting, the Board was close to ordering the second engine offered but the motion was defeated on the casting vote of the chairman (BM 22 May 00). The EinC was still in favour of obtaining an engine from Simpson and Co but the Board resolved to call for tenders locally to build an engine on the pattern of the Hathorn Davey (BM 5 Jun 00). The engine houses and straining well buildings formed the temple of the Board of Works. The bluestone plinths for these lovely French style buildings were supplied by the Footscray and Malmsbury Quarrying Company for ú1,418/0/2 (BM 7 Aug 94). Tenders were called for the erection of the superstructure of the buildings in October 1894 (BM 2 Oct 94). The familiar mansard roof might not have been built because the Board originally called for alternative tenders for mansard roofs or brick towers with hipped roofs. This alternative would have given us a far more Italianate building than the one we know (BM). In the event the successful tenderer was the ubiquitous A.G. Shaw with ú14,802/8/- for the mansard roof design (BM 5 Feb 95). Work was started on the engine houses in April 1895 (AR SES 6 May 95). The contractor exceeded the time of his contract by 126 days to finish in February 1896 (BM 14 Feb 96). Tenders were called for buildings, cages and winding gear (BM 3 Sep 95). The successful tenderer for the buildings was W. Holland for ú1,494/-/- (BM 8 Oct 95). For the straining cages, lifting gear and winding engines the contract went to James OÆGrady for ú1,185/3/- (BM 28 Apr 96). Construction of the buildings began with the southern one in December 1895 (PR 6 Jan 96). Both were completed in April 1896 (PR 7 Apr 96). The contract for the first chimney stack was let to James Mullin for ú1,205/11/5 (BM 14 Jan 96). Work began in February 1896 (PR 10 Mar 96) and was completed in August 1896 (PR Sep 97). The Managing Engineer, T.R. Smith was appointed at a salary of ú350 p.a. with quarters in December 1895 (BM 26 Nov 95). Until his quarters were built he was allowed an extra ú40 in lieu (BM 14 Jan 96). His house was built by T. Corley and was completed in July 1897 for ú1,016/2/- (contr 531). Siemens Bros were contracted to provide electric lighting at the pumping station for ú1,756/15/7 (contr 584). A dynamo and engine was installed in both pump houses and the contract was finished in April 1898 (PR6 Apr 98). Tenders were called for a ôWrought-iron palisade fence, about 6Æ(1.83m) high, in front of the Pumping Station, Spottiswoode, resting on a blue-stone base of rough punched block-in-course, with fine-axed top and weathered slopes, together with three entrance gatesö (BM 18 Aug 96). Successful tenderer was John Stevens for ú429/12/- (BM 27 Oct 96). It was decided at the meeting of 10 Nov 96 to hire 1 Senior Engineer, 2 Junior Engineers, 4 Engine Drivers, 4 Firemen, 2 Coal Trimmers and 2 Cleaners (BM 10 Nov 96). Although 'a proper system of sewerage' had been recommended by a committee of the Melbourne Corporation as early as 1848, it was not until 1889 when 'the city was literally wallowing in its own filth' that moves were begun in earnest to implement a comprehensive system of underground sewerage. That year world-ranking English civil engineer, James Mansergh was engaged to design a suitable sewerage scheme; and from 18 October to 13 December 1889 he worked in Melbourne. Astounded by the squalor of this otherwise marvellous, modern city, he claimed that Melbourne was 30 years behind comparable British cities in sanitation. His report heralded a much brighter future where 'people who have never known what it is to live unsurrounded by cesspits, privvies, night-soil pails or ill-kept earth closets, or other of vile appliances ... will wonder how they could have existed under such conditions when these things have been swept away, and decent water closets have taken their place'. As early as 1854 there was a rudimentary sewerage system operating in Sydney, and a complete one based on deep drainage by 1880. Adelaide had commenced their deep drainage system in 1885. Examples of modern water-borne sewerage systems had existed since the mid nineteenth century in Britain, Europe and America. Underground sewers operated under gravity and also with pumping engines to augment motion. Larger sewers were constructed of brick, with feeder sewers of ceramic or cast-iron. London's elaborate system of drains and sewers, designed by Sir Joseph Bazalgette and built between 1859 and 1865, discharged effluent into the Thames some way downstream. For inland towns a different system was used to accelerate bacteriological decomposition. One of the main reasons for the slow progress towards sanitation was that neither the state government nor the local municipalities were prepared to take action. Underground drainage was expensive and inner suburbs feared a loss of autonomy in co-operative arrangements which involved the Melbourne City Council. Bayside areas declared they had no need for underground sewerage since their effluent drained into the sea. As water-borne diseases reached epidemic proportions during the metropolitan and city boom of the 1880s, councils were forced to face the problem. Death rates from typhoid were now greater than those of London. The conclusions of representatives of the Intercolonial Medical Congress of Australasia held in January 1889 concisely identified the problem; ' ... typhoid fever is a preventable disease which owes its prevalence ... above all to contaminated water supply, defective drainage and improper disposal of nightsoil'. London had been able to avoid council disputes by setting up the London Metropolitan Board of Works in 1855. Vested with appropriate powers, this authority was able to administer the engineering project and run the completed system. After decades of wrangling Melbourne finally followed suit in 1890 with the creation of the Melbourne Metropolitan Board of Works (MMBW) to manage the water, drainage, and sewerage of the city. A Royal Commission on Sanitary Affairs in 1889-90 cited many examples of overseas sewerage systems, as well as those already operating in the colonies. Mansergh's report on the best way to sewer Melbourne was submitted in 1890 with eight possible schemes. One was ultimately adopted in modified form which proposed for sewerage to gravitate through a system of pipes to a common point at Spotswood from where it would be pumped to a sewerage farm at Werribee which purified the effluent then drained it into the Bay. To implement the scheme, Melbourne needed to be surveyed in sufficient detail to enable sewer pipes to be laid and connected to each house. Eight acres (3.25 hectares) of land was purchased from the Spottiswoode Land Company at a cost of ú6296 in 1893. The land was originally owned by John Stewart Spotswood who had purchased about 140 acres in 1847 for ú154. In addition the MMBW purchased 8847 acres (3583 hectares) at Werribee for the sewerage farm. Thirty-six miles (58km) of mains, sub-mains and branch sewers, 273 miles (440 km) of reticulation sewers, and 5000 manholes were constructed by private contractors at a fixed price, using concrete and brickwork for the sewers, and cast iron and stoneware pipes. The two main sewers were largely constructed by tunnelling through basalt or soft ground. The work created a huge demand for labour and materials, and in a time of depression (from 1891) it was helpful in reducing unemployment. After four years of excavation and building works the first connection was made on 17 August 1897 to a hotel in Rouse Street, Port Melbourne. In the tradition of nineteenth century British pumping stations, for instance Papplewick near Nottingham, and Leicester's Abbey Lane Sewerage Pumping Station, the Spotswood example demonstrated a concern for aesthetics as well as the complement of up to date technology necessary for its efficient function. The detailed plans for the sewerage system as well as the design of the actual pumping station have been attributed to German engineer, Christian Kussmaul. Born in Bonndorf, Wurttemburg on 9 January 1851, he attended evening engineering classses from 1867 to 1872, after which he was employed until 1885 in the government railways of Germany and Luxembourg. After rising to superintending engineer he migrated to Australia in 1885 and gained employment as a draughtsman in the Victorian Railways Department designing bridges, tunnels and viaducts. He joined the newly formed Melbourne and Metropolitan Board of Works in 1891 as Chief Draftsman and was in charge of plans, costs and quantities for all the works connected to the sewerage system. By 1898 he had been promoted to Designing Engineer and he continued in this positon until he retired in 1915 aged 64. Kussmaul's European background may have influenced his choice of the Rundbogenstil/ Late French Empire style which most notably characterises the towers flanking the formal entrance at Spotswood. Built in red and cream brick with slate roof and bluestone foundations, the complex consists of a symmetrical arrrangement of twin engine houses with mansard roofed towers framing the entrance to a central courtyard. Two detached polygonal buildings with lantern roofs containing the straining wells stand at either side of the principal buildings, making the arrangement symmetrical. The facades are unified by a series of arched windows within recessed panels. The towers on the engine houses are finished with heavily decorated oeil de boeuf, zinc framed windows. The interest in applying a distinctive architectural style to industrial buildings was not uncommon in the nineteenth century. Harmony Mills in New York bears a striking resemblance, and many other industrial buildings of the period were similarly ornate. The first building to grace the site was a store room. This completed, excavation for the buildings was begun by contractors, W. Flanagan and F. Blayden, followed by the construction of the pump wells by contractors, Garnsworthy and Smith. By late 1894 excavation and construction of the wells was sufficient to allow for the shell of the southern engine house to advance, while at the same time construction of the engines was nearing completion at Thompson & Co., Castlemaine (commenced 1893). By November that year, ten trucks of manufactured metal items were delivered from Castlemaine, and a start was made to position pipes in the engine houses. Work on the northern engine house neared completion to the foundations in early 1895, and by February the second pair of engines arrived from Thompsons. A month later the first of the boilers was tested, and tunnel excavation, and also the southern straining well were completed. By May the only work not finished by the contractors was the southern straining tank. As the year progressed construction of the engine houses proceeded. By August the iron roof principals were in place over the southern boiler house, coal bunker and engine house, and by November the engines had all been delivered from Castlemaine, the boilers were complete, the southern building was nearing completion, the northern one well-advanced, and the mansard roof over the offices finished. The tender for the engine house had specified either a mansard or a hip roof for the towers, depending on the cost. The lowest tenderer, A.G. Shaw, had opted for the mansard in his successful quote of ú14,802.8.0. The building of the straining houses was undertaken by W. Holland between December 1895 and April 1896. By July plans and specifications for quarters for the Managing Engineer were approved by the Board, and the tender price of ú1016 from T. Corley was accepted. That year, tenders were also sought for the erection of a wrought-iron palisade fence about six feet high in front of the pumping station. Constructed by contractor, John Stevens for the sum of ú429.12.0, the fence was to rest on a bluestone base and its three entrance gates were to be flanked with square bluestone pillars. Due to the 1890s economic depression the government preferred that the Board of Works seek local tenders for the pumping station equipment. Accordingly Thompson & Co., of Castlemaine were awarded the contract over leading British and American firms, and they won the job from competing local firms by submitting an unrealistic tender that was ú20,000 lower than its nearest competitor. The firm had gained their experience from the manufacture of steam plant for gold-mining and irrigation works. To fulfill the contract Thompsons had to modify their own plant and work around the clock under specially installed electric lighting. The initial contract was for four pairs of 300 horsepower vertical triple-expansion direct-acting steam pumping engines, six large lultitubular boilers, and a host of associated equipment. The Thompson engines were of an unusual design, each consisting of a pair of triple-expansion engines, with the low-pressure cylinder piston rods direct-coupled to two pump plungers and the intermediate and high-pressure cylinders in tandem direct-coupled to the two further pump-plungers. The four Thompson steam engines and their boilers were brought into commission in February and March 1897. From the start there were difficulties with their performance, particularly their coal consumption levels, and cracks appeared in the pump casings. Their efficiency had to be improved and Thompsons lost money over the contract. In 1899 the Board of Works sought permission to import two further engines from Britain, and was allowed to place an order for a single Hathorn Davey engine, one of the most advanced pumping engines in the world, which was intended to act as a model for subsequent locally made engines. It arrived in 1901 and was operating by October 1902. The other was made by the Austral Otis Engineering Company and installed in May 1902. Austral Otis also supplied modified pump casings, valves, and delivery chambers in 1900 and 1901. Two more pumping engines based on the Hathorn Davey design were installed in 1911, and a further two in 1914. Thompsons were relegated to supplying additional boilers. The two incoming gravity sewers, the Hobson's Bay Main and Yarra Main converged on Spotswood from different directions. The points at which the sewers enter the site are marked by the straining houses. After passing under the north or south strainer houses where any large items were removed by straining cages and taken to the incinerator for burning, the sewers turn and are aligned with the pumping houses. It is here that the sewers run underneath the centre line of the pumping houses through nine feet diameter mains immediately between the paired pumping wells. The six wells in the (north) Yarra Main are 55 feet deep, while the six in the Hobson's Bay (south) Main are 63 feet deep. The sewers entered the north and south engine houses below the floor level where the sewerage was pumped up to a central receiver, the Spotswood Rising Main, located under the roadway and then through three rising mains to the Main Outfall Sewer at Brooklyn. At this point the mains changed to an open outfall sewer which is gravity fed to the Werribee Sewerage Farm (which was opened in 1898 by the chairman of the Board of Works, Mr Fitzgibbon). The pumping station was a large operation that also included a fitting and turning workshop, electrical workshop, pattern makers' store, and toolstore. There was even a tallow production shop which operated as an industrial by-product of the straining wells. When Spotswood opened the workforce consisted of only fifteen men: a senior engineer, two junior engineers, four engine-drivers, four firemen, two coal trimmers and two cleaners. By 1909 there were 66 men. Most staff lived in the district. It was not until May 1941 that the first woman was employed in a technical position. Bacteriologist Lucey Alford was appointed to assist the Pumping Station Chemist, Cecil Parker, in a laboratory which had been set up two years earlier on the first floor of the south tower to research sewer corrosion and bacterial attack on sewer materials. A new toilet was installed for her on the top floor at the western end of the south tower, next to the lab. The Spotswood chemists were relocated to South Melbourne in 1943, although evidence of Alford's laboratory still remains (along with the toilet) in the tower. The station was kept impeccably clean; the engines were highly polished, the floors swept and hosed, the gardens cultivated, and from the 1940s the pump wells were whitewashed. Fear of enemy attack during World War II was particularly strong during 1942. Many air raid shelters were constructed around metropolitan Melbourne and factories were known to have built them in their yards. Three were constructed at Spotswood; one was cut into the retaining wall behind the pump house. The others were constructed of reinforced concrete and stand at either end of the courtyard. Two were for staff, with the third intended for use as control headquarters for the district air raid wardens. All three survive today. In order to cause minimum disruption to the station's essential operations in the event of enemy action, four electrically operated pumps and motors were removed and stored in case the others were destroyed. Spotswood was converted to electric power in 1921 with the installation of electric motors to power the centrifugal pumps. The coal bunkers and boilers were replaced with transformers and switch gear. The advent of electric power meant that by 1929 some thirteen fewer workers were needed to run the station. Steam pumps were kept on standby for emergencies until 1947 when the four remaining Austral Otis engines in the north building and the Hathorn Davey engine in the south building were retired. These engines and two associated boilers have remained at Spotswood. It was predicted that by the 1950s Melbourne would outgrow the Spotswood station. The problem was solved by building deep gravity sewers from Spotswood to Brooklyn and a new high capacity pumping station there. In September 1965 pumping operations ceased when the newly constructed and larger Brooklyn Pumping Station, fed by the new Brooklyn Trunk Sewer (between Spotswood and Brooklyn) became operational. The MMBW also built the South-Eastern Purification Plant at Carrum to deal with south-eastern flows. With the exception of two pumps which were removed to North Wharf, Spotswood remains as it was when shut down, and although the station no longer operates, much of Melbourne's sewerage still flows beneath it to Brooklyn. Some of Spotswood's installations are still in use to control sewerage flows. 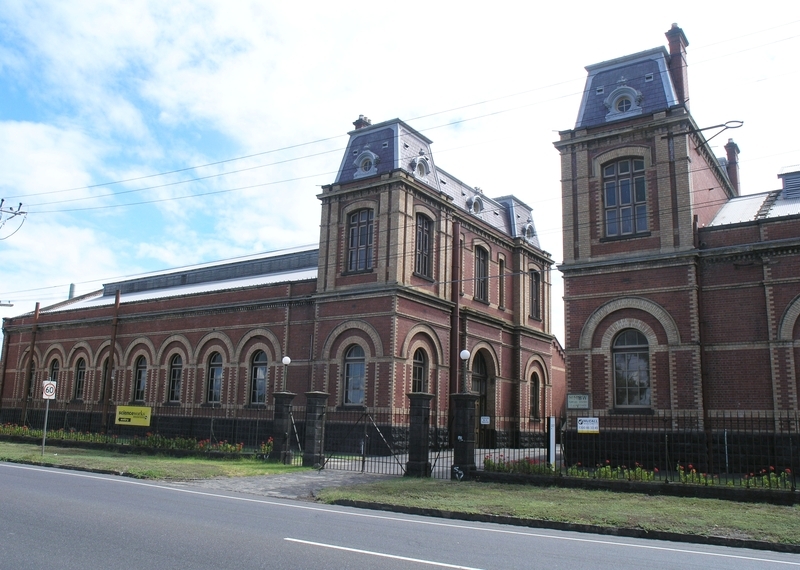 Today the pumping station is in use as part of the Museum of Victoria's Scienceworks Museum which opened in 1992. 4. Nothing in this declaration prevents the Executive Director from amending or rescinding all or any of the permit exemptions. Nothing in this declaration exempts owners or their agents from the responsibility to seek relevant planning or building permits from the responsible authority where applicable. preparation work for painting / papering does not remove evidence of the building's original paint or other decorative scheme. installation of carpets and flexible floor coverings. * Installation of curtain tracks, rods, blinds and other window dressings. * Refurbishment of toilets and kitchens including removal of existing sanitary fixtures and associated piping, mirrors, and wall and floor coverings, and installation of new fixtures, and wall and floor coverings. * Removal of existing kitchen benches and fixtures (stoves etc.) and floor coverings and installation of new kitchen benches and fixtures, including associated plumbing and wiring. Removal of air-conditioners / pipework / wiring / antennae / aerials / and making good. Installation of damp-proofing by either injection method, or "grouted pocket" method. Existing signage may be altered/replaced provided that the new sign is no larger than the existing, is located in the same position and that no internally illuminated signage is used. Modifications to Scienceworks entry as described by Drawing Nos. 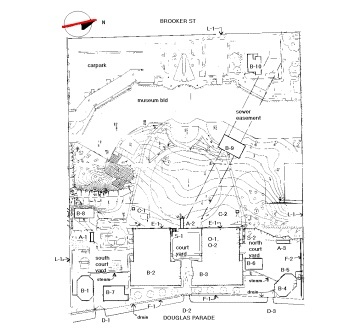 A1-01 "Entrance Floor Plan" & A1-02 "Entrance 1 & 2, Elevation and Section A-A" prepared by SKM.